Malcolm Reynolds 1:6 scale figure coming soon! 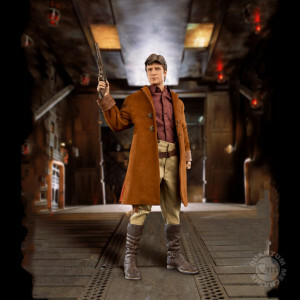 QMx is producing a really nice looking 12-inch Malcolm Reynolds from Firefly action figure. They’re listing the release date as late 3rd quarter. As with all of our coming soon items, contact us if you’d like to reserve one of these guys. I just got notice from the distributor that wave 4 of the 6-inch action figures will be released in June. This looks to be a pretty exciting wave, with re-releases of Boba Fett and the Stormtrooper (both hot items), as well as the addition of a Revenge of the Sith Anakin Skywalker and an Attack of the Clones Clone Trooper, which I imagine will go just as quickly as Boba and Stormy. Keep your eye on our shop, because these guys are going to go fast. Contact us if you’d like to arrange a pre-order. Funko’s new Game of Thrones Legacy action figures will be available in September. These 6-inch scaled figures include Arya Stark, Robb Stark, Brienne of Tarth, Jaime Lannister, Khal Drogo, and Daenerys Targaryen. UPDATE: We will also be getting the first wave: Jon Snow, Ned Stark, Tyrion Lannister, The Hound, a different Daenerys, and a White Walker. We had a bit of drama this week, overselling the Star Wars Black Series 6-Inch Stormtrooper by about 300%. I have more on the way and will be able to fill those orders, but it got me thinking. For future waves, I will put out a call for preorders to get a better idea of how many cases to order, so I can try to have enough stock to supply my customers. The trick will be, as is the case with the Stormtrooper, that the other figures don’t sell as quickly, so it is a balancing act to try to have the figures that folks want while not getting flooded with the ones that they don’t. I have a feeling, looking at the info from this week’s Toy Fair, that there will be more similarly hot figures coming up, including Darth Vader and a Biker Scout with Speeder Bike. So, here’s what I’m thinking. Once the case assortments for upcoming waves are revealed, I will put out a call on MultiverseTradingCo.com, Facebook, and Twitter, asking people to let me know if they are interested in locking in an order on any of the figures in that wave. That will help me know how many to order to try to meet demand. I can’t promise I will, but I’ll do what I can. Check out these Game of Thrones action figures that Funko is producing. Right now, wave 1 is exclusive to Barnes and Noble, but hopefully will be available wider soon. I’m not sure what the release date is on wave 2, but you can be sure that as soon as they become available, I’ll be carrying them in the store. Watch here for the new Multiverse Trading Company site!